In respect of the victims and their families of the Paris tragedy, we are suspending all subscription drive efforts for the weekend and will resume them Monday morning. The drive will be extended through Monday night. Our hearts, thoughts, and prayers go out to the victims of these senseless acts of terror. Welcome to the Apex Magazine Subscription Drive! Each month we release a new issue of Apex Magazine stuffed full with original fiction, poetry, nonfiction, reprints, and more! Most of the content can be read for FREE on the Apex Magazine website, but producing an amazing publication month after month that features both seasoned pros and new writers does cost money. We want to offer our content on our website – and will continue to do – so that everyone can experience the soul of Ursula Vernon’s “Pocosin”, the haunting beauty of Damien Angelica Walter’s “Not My Monkeys, Not My Circus: The Elephant’s Tale”, the devastation of Rachel Swirsky’s “If You Were a Dinosaur, My Love”, and the heart-pumping action of Rich Larson’s “Going Endo” but subscriptions and individual issue sales pay our authors and artists. That’s why for the next two weeks (November 2nd through November 16th), we’re hosting a subscription drive to boost the number of subscribers to Apex Magazine. 2016 is quickly approaching and we want to make it another outstanding year! Reaching our subscription drive goals will help ensure this happens! 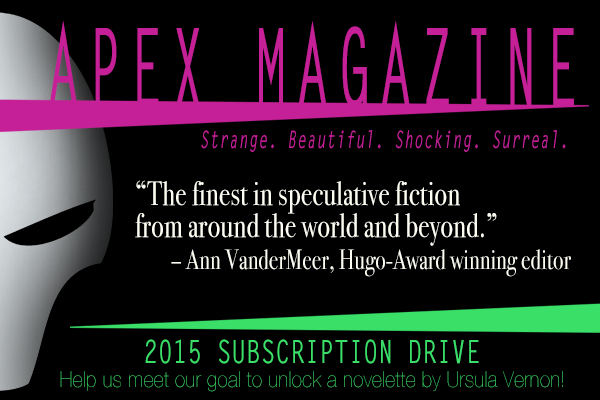 Our goal for the 2015 Apex Magazine Subscription Drive is $5,000. Completely doable, but not without the support of our readers and fans. To help us reach this goal, we have set up rewards which will make the January, 2016 issue of Apex Magazine off-the-charts fabulous! The current ToC for Issue 80 includes brand new stories from Ursula Vernon, Lettie Prell, and Jennifer Hyke, poetry by Samson Stormcrow Hayes, Zebulon Huset, Anton Rose, and Greg Leunig, and a nonfiction article by Lucy A. Snyder. The cover art is by Matt Davis. $5,000 – A new novelette by Ursula Vernon, set in the same universe as her Nebula award winning story “Jackalope Wives”! $6,500 – Stretch Goal! We will open to short fiction submissions on December 1st, 2015, rather than January 1st, 2016. Wow! That is a lot and it is all amazing! Help us publish the most epic issue of Apex Magazine to date and make 2016 the best year yet! Share the love of Apex by purchasing a gift subscription for the scifi lover in your life. Get every issue of Apex Magazine currently published (1 through 78) for only $40!